Recipe Copyright © 1998 Kasma Loha-unchit. 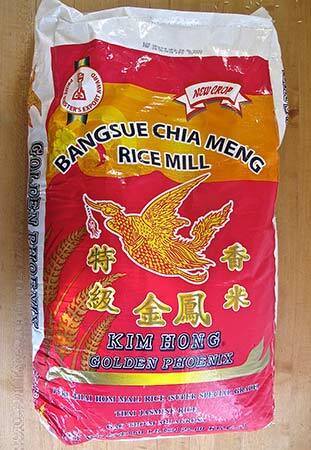 See also: Kasma's Jasmine Rice and her blogs on Thai Jasmine Rice – (Kao Hom Mali): Part 1 & Part 2. Here's Kasma's blog on How to Cook Jasmine Brown Rice for Maximum Nutrition. Jasmine rice tastes best steamed. Steaming fluffs up the rice and retains the fullness of its natural fragrant flavor. Here is an almost foolproof method to get "perfect" rice each time – with no measuring – and without an electric rice cooker, which can produce mushy rice at the bottom of the pot. All you need is a deep, heat-proof bowl, a pot in which it fits and a trivet to lift the bowl off the bottom of the pot. Or, you can use an Oriental stacked steamer if you have one. Fill the bottom of the pot with a couple of inches of water and bring to a boil. At the same time, heat a kettle of water on a separate burner. Place rice in the bowl to fill it about halfway. Rinse a few times and drain. Balance the bowl on the trivet inside the pot (or place on a steamer rack of a stacked steamer set) and pour boiling water over the rice to about three-quarters of an inch above the rice line (the rice tastes better when hot rather than cold water is added to it initially). 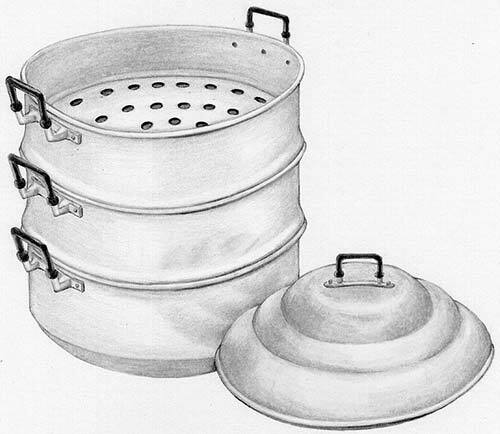 After you have added hot water to the rice, cover the pot and steam at medium heat, or at a level where you can still hear the sound of water boiling on the bottom of the pot or see steam escaping from underneath the lid. The rice will be cooked in about 25 minutes, longer if you are cooking a denser mass of more than 6 cups of rice. You need not worry about overcooking or burning the rice should you forget to turn off the heat after more than half an hour, because once cooked, the steam from the boiling water will only keep the rice warm until you are ready to serve. 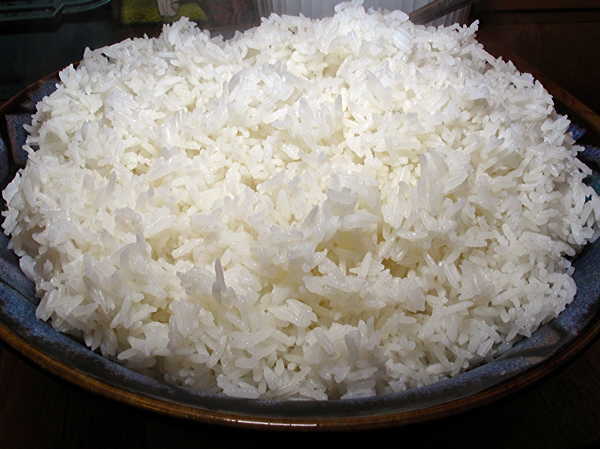 New-crop rice grown in the current season has not dried out as much, and therefore, takes less water to cook no matter what cooking technique you use. Fortunately, new-crop rice usually will be labeled as such, but check the year, as time spent on the ship, in the distributor's warehouse and in the store may have aged the rice. If you have problems cooking new rice you may wish to try cooking a smaller quantity in a shallower pan. The simple method described produces great-tasting, evenly steamed rice with grains that stay whole (unless too much water is added). This is because none of the grains are boiled or come in close contact with an intense heat source (as the bowl is lifted) which can cause rice grains to break down, losing flavor and aroma. The hot water added to the rice no longer boils but is gradually absorbed by the grains as they are cooked by the surrounding steam. Over the years, many of my students have found that this method of steaming rice is one of the most important cooking techniques they learned in my Thai cooking classes. It has helped them appreciate rice more (especially jasmine rice), and this is important, as rice is the main source of nutrition to millions around the world. Note: Kasma's preferred brand is Golden Phoenix.